» PHAS Outreach » 2015 » June » 04 » Make your own Bristle Bot! These small devices run mad! Each consists of a vibrating motor, a battery, some wires, and a toothbrush head. The vibrating motor is like the ones used in cell phones to make them vibrate. We used to salvage the motors from used cell phones when we first started working on this activity. The electricity from the battery powers motor, which has an unbalanced mass on the shaft, causing it to vibrate; the vibration shakes up the toothbrush head. Because the toothbrush head has many little “legs,” the bristle bot stays mostly stable and randomly moves around. A toothbrush head (the wider and flatter the better). Saw off the handle and clean up the sharp edges using a piece of sand paper. A vibrating motor with wires soldered on. You can salvage the motor from a used cell phone, or purchase one from your local electronics store. We use this one (CAT# DCM-371) ordered from All Electronics. Two wires soldered onto the motor. Be careful not to make the wire leads touch each other. 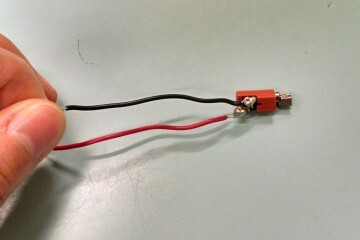 This will short the battery (the battery will heat up and could become dangerous). Adult supervision needed for soldering, hot glue gunning, and sawing off the toothbrush handle. Wrap the elastic around the battery length wise. This is to hold the wires at each end of the battery. Tape in place. Tape the motor onto the battery , making sure the vibrating part of the motor is free to vibrate (do not tape over the vibrating part). 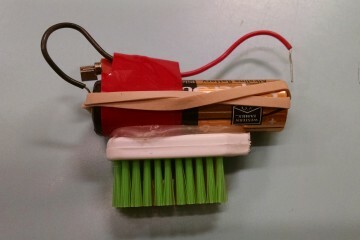 Hot glue the toothbrush head to the battery, making sure it is right below the motor to keep the robot stable. Intro to motors, and where they might find vibrating motors (eg. Games, toys, cellphone, toothbrushes). The toothbrush heads are not always stable, but it is not difficult to remove the glue after it has hardened. Test out where the battery should sit on the toothbrush head to keep things balanced. You can probably watch the bristle bots dance around the whole day, but we have seen enthusiastic summer camp students “dueling” the bristle bots they made.